You need a ghost stories download when you can't be at your computer. If you're headed out of town or you just want to be mobile, this is where you can find stories to-go. Grab a ghost story download below and be on your way! When Valerie inherits a massive estate on the edge of town, she can't believe her good fortune. She finally has something to call her own. But it doesn't take long for Valerie to discover she's not alone in the house. And its secrets are dying to be told . . . "John?" called Valerie, softly at first, determined to remain calm. A creak in a floorboard was the only discernible response. She glanced behind her and felt something approaching. As the hair on her arms bristled, the bedroom door slammed shut. Something unseen was approaching. "John!" she cried as she was engulfed by the most foul smell she had ever experienced. She ran to the door to escape, but it was stuck. The doorknob wouldn't even turn. It was as if someone was holding it from the other side, refusing to let it budge. She pounded on the door, terrified, yelling as loudly as possible. "John! John!" she cried, pounding on the door and twisting the knob. She cringed in horror when someone  something  on the other side began to pound in return, mocking her. When she felt the knob jerk back in her hand, her hands flew to her mouth, eyes wide, terror screaming throughout her entire body. She watched the knob twist and turn violently as the pounding droned on and on, echoing in her ears and in the room around her until after some time, she dropped to the floor and began to cry. Half an hour later, the door drifted open, gliding silently on its hinges while Valerie remained in a heap on the floor. 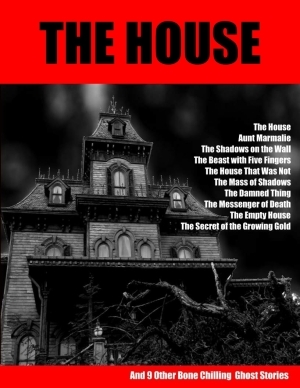 The House and 9 Other Bone Chilling Ghost Stories is a ghost stories download and a spine-tingling collection of supernatural tales. With over 100 pages of bone-clattering horror, the terror will keep you awake well into the night. Because it is available by instant download, you will get hours of entertainment right this very minute, without having to wait for the postman or a drive to the store. This ghost stories download is a collection of haunting stories will terrify you well past dawn for less than it costs to rent a movie or buy a latte. But it will last far longer than a movie and can be read over and over again. Because this book is digital it doesn't rely upon gasoline for delivery. You can be proud because your purchase contributes to the environment. Don't sit in front of a computer where your neck and back muscles get tight, tired and sore. When you get this nifty ghost stories download of eerie, unnerving ghost stories, you can print out a few or all of the pages and take them whereever you like to go. You can curl up in bed with your ghost stories download, take it camping or read it in the tub under a cascade of bubbles. Read it in your favorite easy chair, read it under the blankets, read it in the car, at the park, in the lunchroom or at the doctor's office. Now that's something you can't do with a laptop! When was the last time you looked for a ghost story to read? I'm not talking about little kids' stories or cute little tales of pumpkins and Jack O'Lanterns. I'm talking about scary, adult-level ghost stories. Whether it's at the bookstore or the library, ghost stories aren't always that easy to find. And while your selection may look promising at first, you often end up with a mere murder mystery, where the "ghost" is just a figment of someone's imagination. How frustrating to have your heart set on stories of the undead or supernatural, only to find out the evil one is a living being. These are 100% pure stories of specters, demons and things that go bump in the night. Reading these ghost stories could help you make more money. Did you know that reading is proven to make you smarter? It expands your vocabulary and creativity. It increases your problem solving skills. Better skills could help you get a better job. If you get a better job, you might make more money. So read more and start living better. And if you're going to read, read what you love. Buy and read The House and 9 Other Bone Chilling Ghost Stories. We accept Paypal and all major credit cards as well as debit cards.